Upside down fire? I know, it sounds crazy, but it really works GREAT!!! 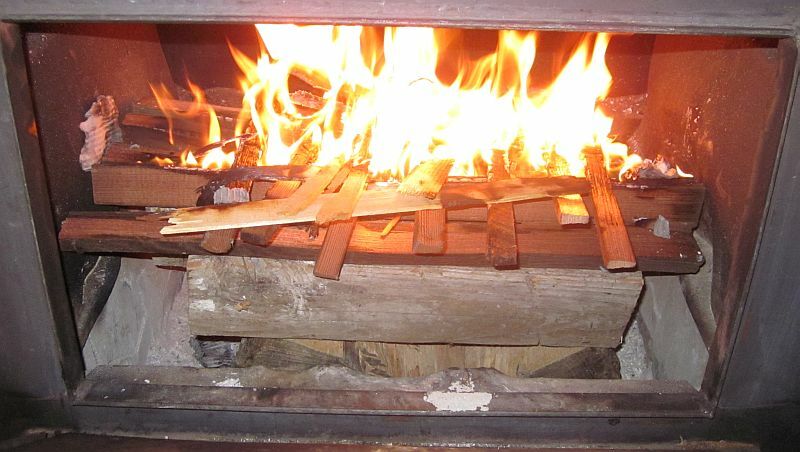 It is better to build your fire upside down: Put the paper on top, then kindling under that, then the bigger wood at the bottom. So I did some research, and it turns out that there are plenty of believers in this “Build your fire upside down” movement. You’d think after all those years at Scout Camp, receiving the Firem’n Chit card, and becoming an Eagle Scout, that I’d be fully aware of any and all possible ways to effectively start a fire, right… RIGHT!?!? Well, in all my research I learned that while heat does in fact rise, the heat radiating from a fire is what really gets things cooking, and since heat radiation flows in all directions, it doesn’t matter that each subsequent layer of fuel being ignited is below the one burning. 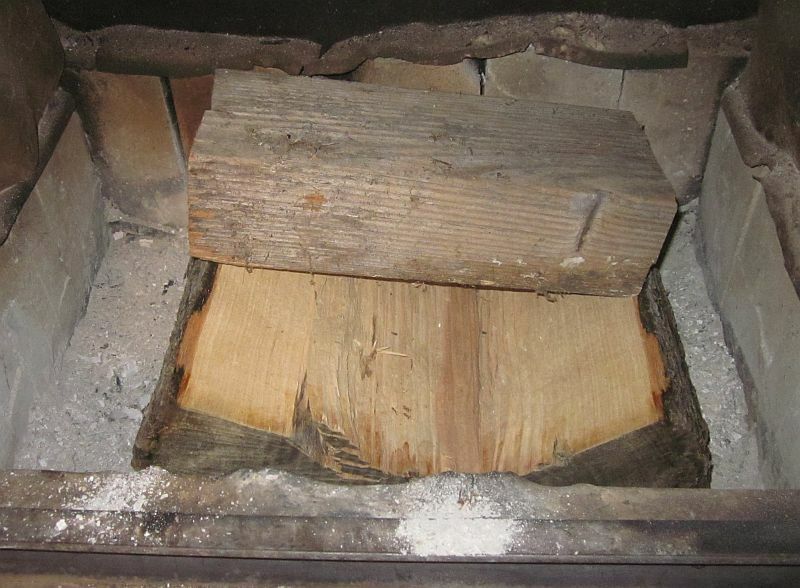 As the kindling burns in a traditional setup the wood collapses on itself and can have a smothering affect on the fire. Also, you don’t have the issues with your perfect teepee / log cabin shifting all over the place as the pieces burn and the structure crumbles. You don’t have to keep tending the fire, moving pieces around, adding larger pieces, etc. You should be able to “set it and forget it” (ok, never do that with a fire)… er, light the fire and not have to “tend” it so much for at least a few hours. 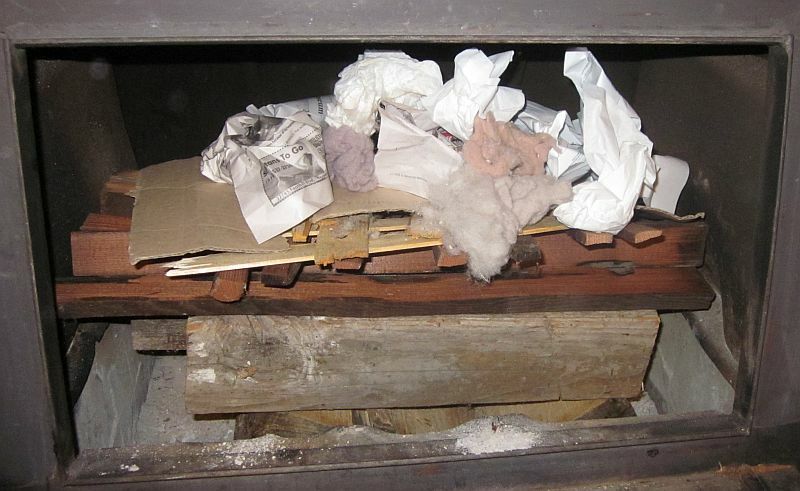 Upside down fires will tend to start with less smoke than a standard fire setup. 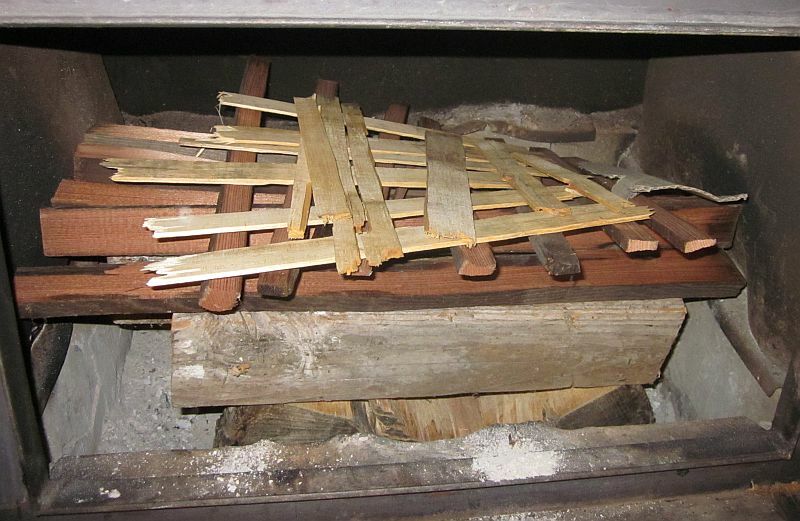 It is a very consistent method for starting a fire. Well, being a lover of experimentation and trying new things, I decided I had to give it a go! A single light to the “dryer lint” and within minutes things are looking really good! 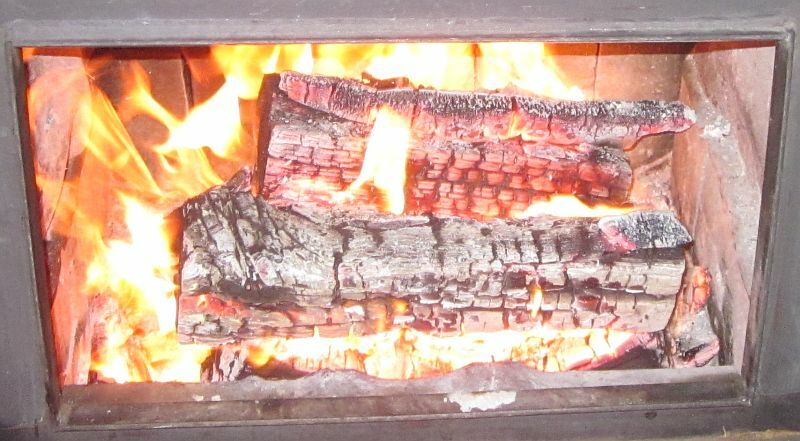 During each “stage” the radiant heat lights the “stage” below the first. Also the burnt pieces fall as they burn and help to ignite the pieces below them. About 15 minutes into the burn and I’m very impressed! The kindling has taken really well and it looks like the 4×4’s are about to take too! Approximately 35 minutes into the burn and the 4×4’s are engulfed in flame and starting the large splits! Almost 2 hours after ignition I’ve got some great looking coals! Well, I’m converted to this new way of starting fires!! I couldn’t find any cons to starting the fire this way. The only thing I noticed is that the fire didn’t seem to start up and heat up as quickly as my standard method. Honestly, it wasn’t really an issue and I figured it could be a function of a bunch of factors like fuel, configuration, air intake, etc. I plan on doing more experimenting with less kindling, different configurations of the wood, and other factors. I’d be pretty impressed if I can start a super good fire with less kindling than I’ve been doing up to this point. By far, all the pros listed in the beginning of this post are spot-on, and I’m definitely starting all my fires with this new configuration! Please give it a try and report back with what happened! 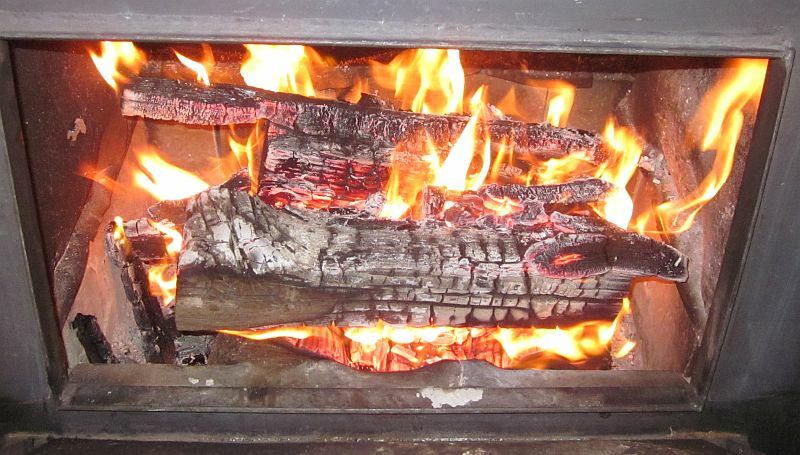 THERE’S NO QUESTION THAT REVERSE BURN FURNACES ARE VERY EFFICIENT. MY PARENTS HAD ONE IN THEIR YEAR-ROUND ADIRONDACK MOUNTAIN VACATION HOME THAT BURNED 4 FOOT LONG, 6-8 INCH DIAMETER LOGS. 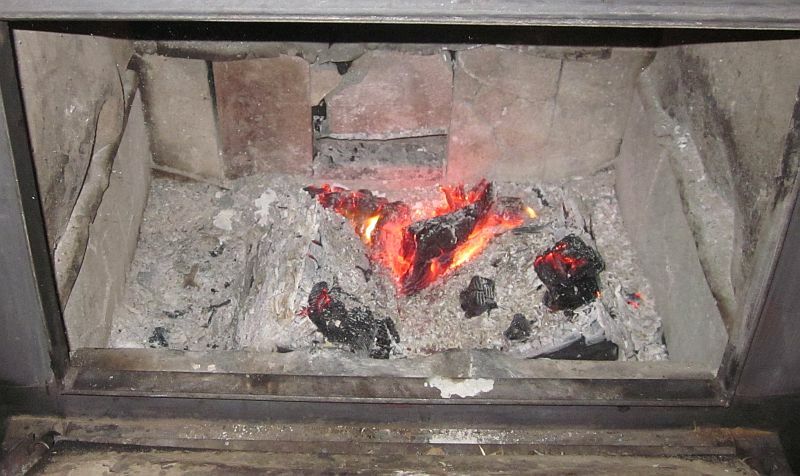 IT ROASTED THE LOGS, DRIVING OUT MOISTURE, THEN COMBUSTIBLE GASSES WHICH WERE USED TO FEED THE FIRE, TURNING THE LOGS TO CHARCOAL WHICH THEN BURNED. THEY COULD CHARGE THE FURNACE SUNDAY AFTERNOON, GO HOME AND COME BACK NEXT FRIDAY EVENING TO A WARM HOUSE. FORCED DOWN DRAFT RESTRICTED COMBUSTION AIR BURNERS ARE ALSO USED AS PYROLYZING BURNERS, THE HEAT OF COMBUSTION ROASTS THE WOOD OR OTHER FUEL BELOW RELEASING COMBUSTIBLE GASSES WHICH CAN BE BURNED IN STOVES OR ENGINES, WHILE THE ROASTED WOOD IS CONVERTED INTO CHARCOAL WHICH CAN BE HARVESTED OR ALLOWED TO BURN. 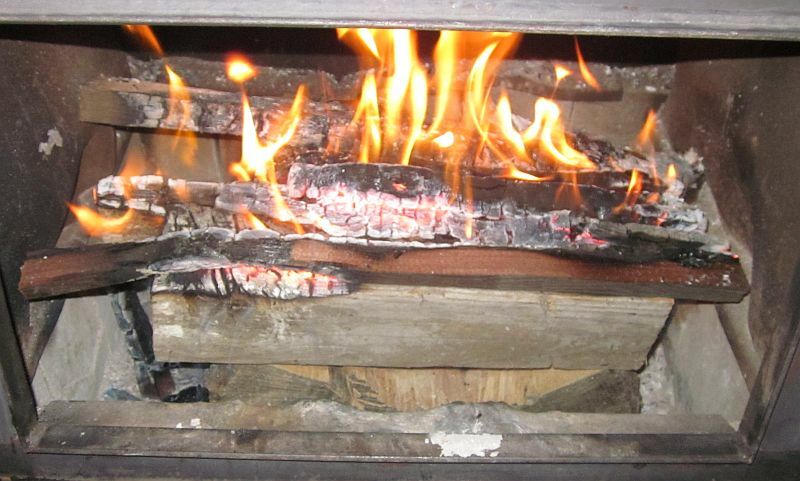 THE RESTRICTED AIRFLOW ONLY PROVIDES ENOUGH OXYGEN TO SLOW BURN THE WOOD, WITH INSUFFICIENT OXYGEN TO BURN THE GASSES. SEE ALSO; http://www.google.com/search?q=WOOD+GAS+GENERATOR&ie=utf-8&oe=utf-8&aq=t&rls=org.mozilla:en-US:official&client=firefox-a#q=WOOD+GAS+GENERATOR&hl=en&client=firefox-a&hs=j2X&rls=org.mozilla:en-US:official&prmd=ivnsb&source=univ&tbs=vid:1&tbo=u&ei=MXUjTbusLoSglAfmupRJ&sa=X&oi=video_result_group&ct=title&resnum=6&ved=0CEMQqwQwBQ&fp=3546717b9b9556d9 OR GOOGLE WOOD GAS GENERATOR.